One of the major features of partitioned datasets is the ability to define partition-level dependencies in recipes. For more information, please refer to the DSS concepts page. For a given recipe, partition dependencies allow you to compute which partitions of the input datasets are required to compute the requested partition of the output datasets. Partition dependencies are specified per dimension : for each dimension of each input dataset, a dependency function is used to compute which dimension values are required. Dependency functions can be “relative” or “absolute”. “Absolute” dependencies are often used when the output dataset is not partitioned, because in that case, we need an “absolute” function to generate the list of required input values. The “time range” function can be used both as a “relative” or “absolute” function. More information about the Time Range function is available below. Input dimension must be time-based. If there is an output partition, it must also be time-based. There are no constraints on the time levels. Yields all time periods in a time range relative to the output. More information about this function is available below. Input and output dimensions must be time-based. Yields all time periods (days or hours) corresponding to days between the beginning of the week defined by the output and the output date. Stops at the output date. Note: You can use the partition spec syntax to define ranges. Lists the partitions of the input dataset available when the recipe is run and selects the “latest” one. For non-time-based dimensions, “latest” is defined as “last by alphabetical ordering”. All available Absolute Lists the partitions of the input dataset available when the recipe is run and selects them all. Time range generates a list of days or hours between a “FROM” date and a “TO” date. The granularity of the dates is limited by the granularity of the input dimension. The “all available” and “latest available” dependency functions are quite special: they can only return partitions that already exist. Therefore, it is not possible to generate new partitions using these dependencies function. The “logs” and “log2” datasets are partitioned by DAY and we want to compute with SQL a historical report that uses the whole history. A first way that comes to mind is to use a “All available” dependency between “log2” and “report”. The “new” partitions of “log2” corresponding to the “new” days present in “logs” will not be handled. Use a “time range” dependency. As the output dataset is not partitioned, the time range will be interpreted relative to “NOW”. You setup your dependency to go from “the origin of time for this project” to “0” (ie, to the current day). 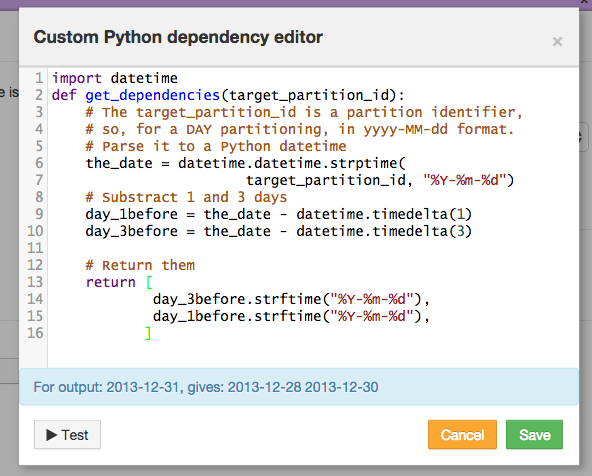 For advanced use cases, you can write your own dependency functions in Python. Sometimes, a time-based dataset is not “complete”. For example, a dataset might be produced on the 1st and 15th of each month, and you want to depend on the “proper” one. The function must return the list of Partition identifiers required to compute target_partition_id of the output dataset. The following image illustrates a simple example where we always return “the previous day” and “3 days before” as dependency.